Edgar A. Fouché was born in rural south-central Georgia to fifth generation French Americans. Edgar and many generations of his relatives have historically been involved with the government and military in fields of intelligence, black programs, crypto, secure communications, and classified development projects. This is true as far back as the French revolution. Joseph Fouché was the Prime Minister under Napoleon, the head of his secret or national police force and a direct ancestor of Mr. Fouché. Joseph Fouché started and controlled the world’s first professionally organized intelligence agency. The CIA, KGB, MI 5, Mossad, etc., used and expanded on his methods of intelligence gathering, networking information, and political survival. Some French historians consider him a scoundrel because he survived many of his leaders, including Napoleon and the King of France, instead of going down with the ship, so to speak. The current Fouchés are proud of being descended from the Free French who opposed slavery, at great financial and personal expense, before and during the Civil War. The Fouché family moved from city to city frequently during Edgar’s childhood. After leaving Americus Georgia, they settled for a few years in San Antonio, Texas. Yes, the move to S.A. from Georgia in “Alien Rapture,” that little Joe Green experienced really happened as written. Go figure? Edgar’s mother’s family, the Rothschilds Russells, are of French German heritage and his grandfather Russell was a Nazarene preacher. All of the Rothschilds on my mother’s side were poor. Edgar graduated from Longview high school in East Texas, where he was a Thespian, an Honor student, a member of the Student Council, and on the football team as Captain of the Defensive Team. The Vietnam war was escalating and many of his friends and peers were sucked into the tragic political vortex. In February of 1968 while attending Kilgore College and working as a machinist making bombs for R. G. Le Tourneau Industries. That month the military drafted a record high number of young men into the services, one of which was Edgar Fouché. Edgar went to Lackland AFB for Air Force basic training where he volunteered for Pararescue Training. Pararescuemen jump out of helicopters to rescue downed pilots, usually under fire in a hot zone. He fractured his ankle before jump school at the Fort Benning and was then shipped off to Keesler AFB, Mississippi. Edgar initially went through a year of electronics, communications, intelligence, and cryptological schools. During the years 1967 1974, Edgar was stationed or worked at many Tactical Air Command (TAC), Air Training Command (ATC) bases, and Pacific Air Command Air Forces (PACAF) bases. He was at Kadena AFB Okinawa; Udorn AFB Thailand; Ben Hoi AFB Vietnam, and spent anywhere from a day to a month at many other South East Asian military bases. (A total of 3.5 years in Asia). He attended several universities, including the University of New Mexico, the Air Force College, and the University of Maryland. He received degrees in Electronics and Avionics Engineering from the Air Force and a BS in Business. Somewhere along the line, Edgar joined the Masonic Lodge (later quit), became a licensed deep sea diver(with many PADI certificates) and was trained by Rostelov Jukov (Russian Defector) , and received pilot training and became an avid woodworker. This is a photo of Ed from Basic Training. Ed Fouche Circa 1980 in Houston. Ed sitting front row at a Pentagon Hearing in 1987. To this day I’d be hard pressed to explain to you unique electrical, optical, and physical properties of Quasi Crystals and why so much of the research is classified. Even the unclassified research is funded by agencies like the Department of Energy and the Department of Defense. Why is the US Department of Energy and Ames Laboratory so vigorously pursuing research with Quasi crystals? What is the DOE New Initiative in Surface and Interface Properties of Quasi crystals? That’s the unclassified part. What are Quasi crystals? In 1984 a paper was published which marked the discovery of quasi crystals–Two distinctly different metallic crystals joined symmetrically together. By 1986 several Top Secret advanced studies were going on funded by DARPA with leading scientists already working in the field. In classical crystallography a crystal is defined as a three dimensional periodic arrangement of atoms with translational periodicity along its three principal axes. Since Quasi crystals lose periodicity in at least one dimension, it is not possible to describe them in 3D-space as easily as normal crystal structures. Thus it becomes more difficult to find mathematical formalisms for the interpretation and analysis of diffraction data. After the ‘official’ discovery of Quasi crystals in 1984, a close resemblance was noted between the icosahedral quasi crystal and the 3D-Penrose pattern. Before quasicrystals were discovered in 1984 the British mathematician Roger Penrose devised a way to cover a plane in a nonperiodic fashion using two different types of tiles. An simple example of 3D tiling can be seen on the SLIDE. The tiles are arranged in a way that they obey certain matching rules. This is called a 3D-Penrose Tiling, which is made up of rhombohedrons instead of the rhombi. A dozen years later, ?Penrose tiling’ became the prototype of very powerful models explaining the structure of the Quasi crystals discovered in rapidly quenched metallic alloys. Fourteen years of quasi crystal research has established the existence of a wealth of stable and meta-stable Quasi crystals with five-, eight-, ten-, and twelve-fold symmetry, with strange structures and interesting properties. New tools had to be developed for the study and description of these extraordinary materials. I’ve discovered that the classified research has shown that Quasi crystals are promising candidates for high energy storage materials, metal matrix components, thermal barriers, exotic coatings, infrared sensors, high power laser applications, and electro magnetics. Some high strength alloys and surgical tools are already on the market. One of the stories I was told more than once was that one of the crystal pairs used in the propulsion of the Roswell crash was a Hydrogen Crystal. Until recently, creating a Hydrogen crystal was beyond the reach of our scientific capabilities. That has now changed. In one Top Secret Black Program, under the DOE, a method to produce hydrogen crystals was discovered, then manufacturing began in 1994. The lattice of hydrogen quasi-crystals, and another material not named, formed the basis for the plasma shield propulsion of the Roswell craft and was an integral part of the bio-chemically engineered vehicle. A myriad of advanced crystallography undreamed of by scientists were discovered by the scientists and engineers who evaluated, analyzed, and attempted to reverse engineer the technology presented with the Roswell vehicle and eight more vehicles which have crashed since then. Early static prototype of a very Top Secret F-117 at the very classified Groom AB. We called it ‘Have Blue’ back then. This smaller proof-of-concept model of the F-117 first flew at Groom in December 1977. Testing of a series of ultra-secret prototypes continued there until mid-1981. 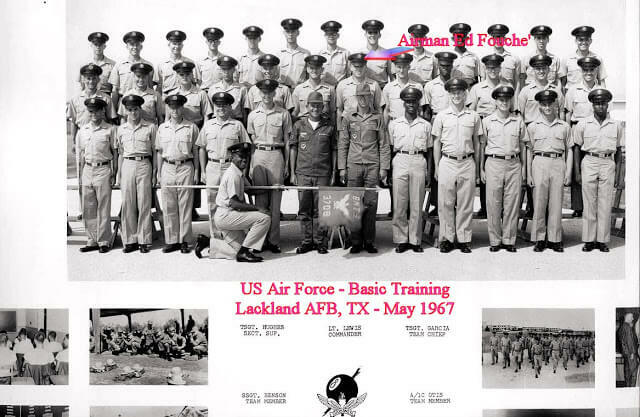 (Edgar Fouche was stationed at Nellis AFB from76-80) Groom was a short airplane or helicopter ride from Nellis AFB. The guy to the left of Edgar Fouche is Bob Green, Avionics & Computer Engineer, and C*A employee. The little guy to the right of Edgar Fouche is CMSgt. Billy Snodgrass (A&E specialist) who has a niece who was a well known actress. Edgar Fouche worked with Bob at the Flight Operational Test & Evaluation (FOT&E) center at Edwards AFB (CA) where they did R&D on the F-111, F-15 & F-15 Streak Eagle, A-9, A-10, original B-1, and other still classified prototypes. We also worked together at Nellis AFB & Groom AB (NV), and we both had offices at Kelly AFB (TX) in the mid 80s when I was the SAC Liaison. Bob was in Saudi and Diego Garcia during both Iraqi wars. Now retired. No I can’t tell you where I got all of my photos. It’s pretty obvious. The guy who took this photo worked for Bob Green. The main topic I want people to focus on with Edgar Fouche’s testimony is his disclosures about Quasicrystals and Metamaterials (which at the time in 1998 were not well known to science) Many of the great potentials of metamaterials and quasicrystals have begun to leak out into the public domain and many recent scientific discoveries in the fields of metamaterials and quasicrystals have come forth since Edgar Fouche made his Disclosure giving accurate predictions that these would be emerging fields in science and nanotechnology. Sure enough we have Michio Kaku hinting at invisibility technology through the use of metamaterials, although, he says we are not quite there yet to make things invisible to the human eye. Edgar Fouche’s Disclosures of the Magnetic Flux Field Disruptor (MFD) or Mercury Plasma Vortex Centrifuge as the propulsion system that enables antigravity, which is by far the most convincing argument I have ever seen for a theoretical antigravity device. Shortly after Ed Fouche’s Disclosures lots of evidence started pouring out of Germany about a Top Secret NAZI Project hidden in the mountains of Czech-Slovakia towards the end of WW2. Yakov Sporenberg’s Affidavit sparked a wave of research and books that shone light on a whole other branch of Operation Paperclip and the technological spoils of War. The Scientific Discoveries of Dr. Eugene Podkletnov (which began in 1992 so they pre-date Ed Fouche’s testimony) Also provide experimental observation of just such an effect. With subsequeny testing and some verifications performed by ESA, NASA, Boeing, and others we are beginning to see both breakthroughs and cover-ups of this technology. Only time and independent testing, science, and verification will tell us if Ed Fouche is telling the truth or not. When I get the funding and resources, I will absolutely re-perform the Podkletnov experiment as well as do further testing and research into rotating superfluids and plasmas.